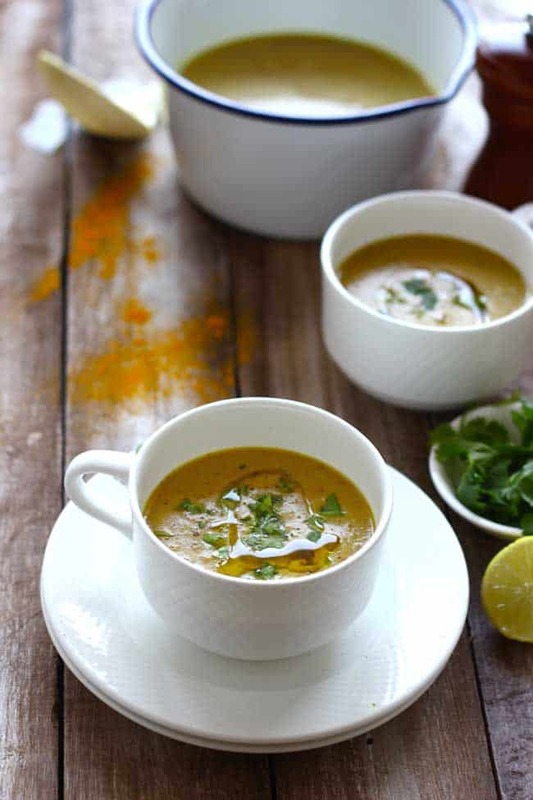 Mulligatawny Soup is an English soup recipe with origins in Indian cuisine. To be more precise the roots of its origin are in the Anglo-Indian Cuisine developed during the British Raj in India. The name originates from the Tamil words millagai/milagu and thanni and can be translated as “pepper water”. 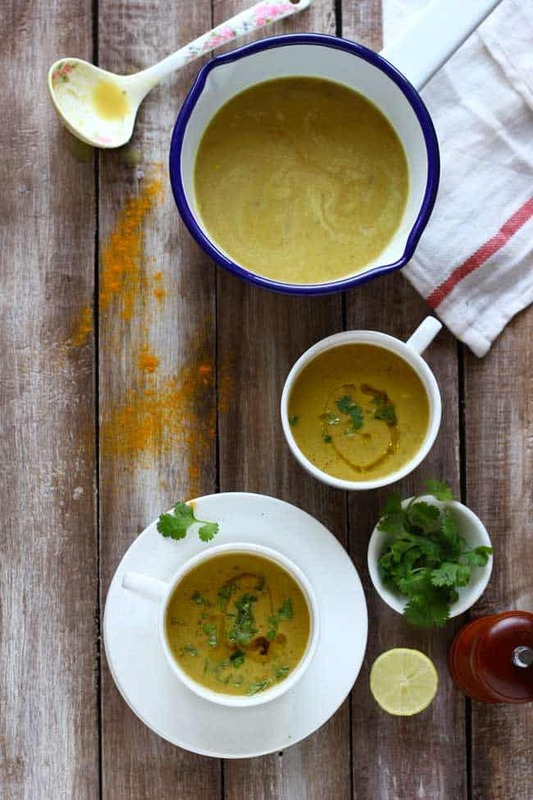 Many relate Mulligatawny Soup with the pepper rasam recipe as well. Both have quite a few similarities as well. 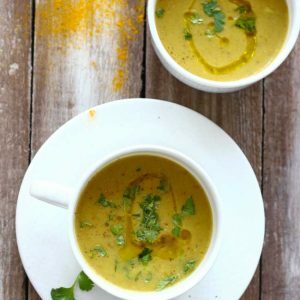 But Mulligatawny Soup is thick in texture and is much more than just a soup. It can be happily placed in the category of one-pot meal bowls. It has lentil, rice, plenty of vegetables, coconut milk and herbs. All that required making hearty, fulfilling and comforting one bowl dish. This soup recipe from the British era caught my attention while reading Curry: A tale of Cooks and Conquerors. 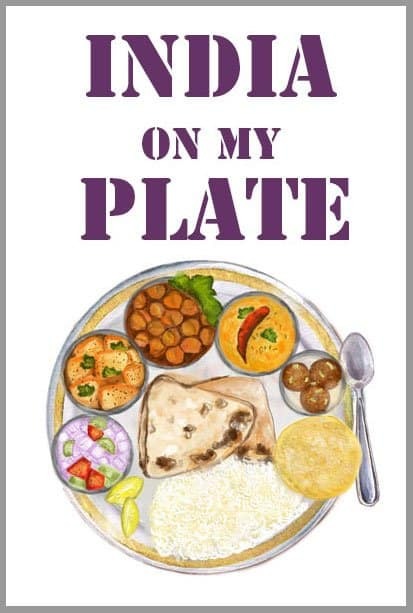 The book revolves around the journey of Indian curries from the pre-Independence era to the renowned British Balti Houses. Somehow, in between many Anglo-Indian Recipes mentioned in the book, this one caught my attention. Never I have tried a soup recipe before with lentils, rice, veggies, and spices. 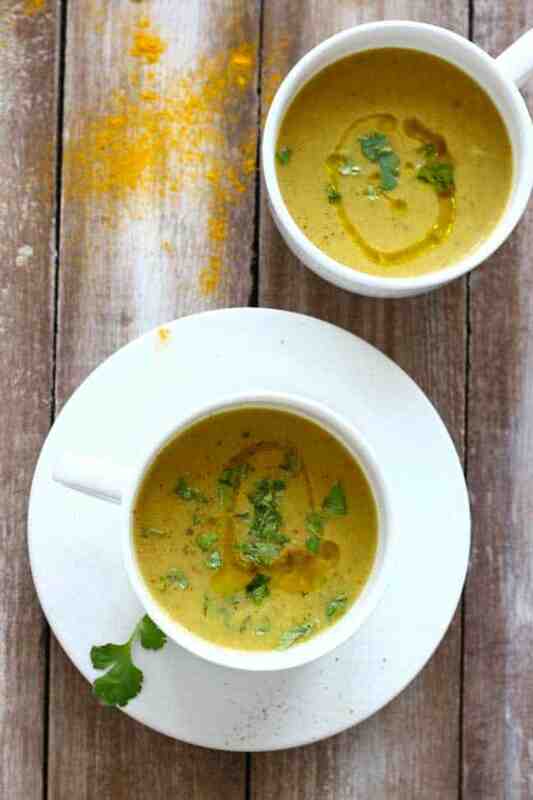 Though sometime back we did Curried Pumpkin Soup Recipe and it too has curry powder seasoning. But Mulligatawny Soup is quite different from that one. It is a richly flavored soup, spiced with curry powder. Perfect for a cold day. Many prefer serving it with a dollop of tangy sour cream. I deliberately gave it a miss and drizzled lemon juice instead. Anyway, there are some fun new things on the to-do list lately. There is a family wedding coming up in the first week of February. And this wedding gig is going to take me away from the blog for a while. If you follow my Instagram stories, it’s no secret. And — you guys — till then enjoy this Mulligatawny Soup. Stay warm and wait for the spring! Start with preparing and chopping all the vegetables. Set aside. Rinse and soak the rice and lentil in two separate bowls in enough water. Heat oil in a large saucepan ( buy it here ). Add bay leaf, celery stalks, onion and garlic. Saute for a minute or till the aroma of herbs is released. Next add the diced carrots and potato. Stir and cook for 2 - 3 minutes over medium-high heat. Stirring regularly until the vegetables are beginning to soften and brown lightly. Add the diced tomato and cook for a minute. Drain water from the rice and lentil. Add both of them in the saucepan. Stir and cook for a minute. Pour coconut milk and stir to combine nicely. Season with salt, pepper and curry powder. Now add the warm stock water and the turmeric powder. If required, add lukewarm water to adjust the consistency of the soup. But this soup is bit thick in texture. Bring the soup to boil once and then reduce the heat to low. Allow the soup to simmer, covered till the grains and vegetables are cooked. Stir the soup at regular intervals. When the soup is ready, cool the soup for a few minutes and blend with a stick blender or in a food processor until smooth. If you want a more rustic texture to the soup, do not blend. Before serving, heat the soup for 3–4 minutes until piping hot and check the seasoning. 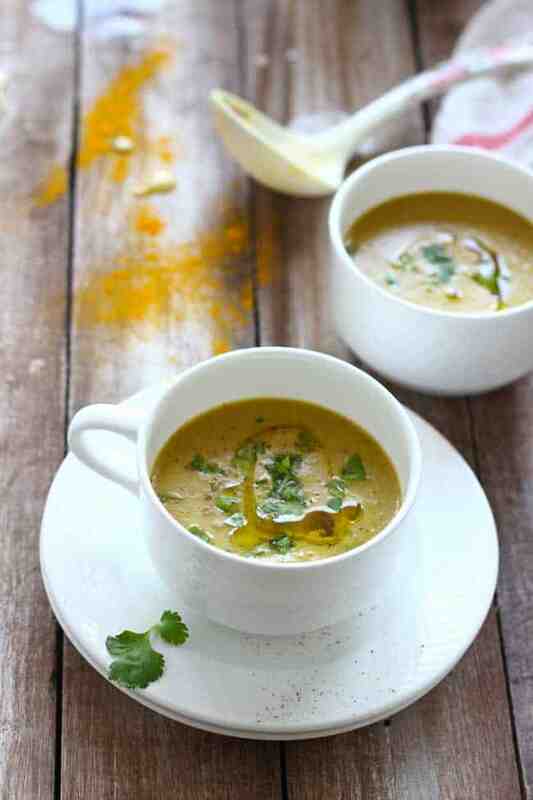 Ladle the soup into deep bowls and top each with a spoonful of chopped coriander. Drizzle lemon juice. Serve Mulligatawny Soup warm. Fantastic recipe, was a hit with my book club ladies. Recipe perfect as written. My new go–to recipe – I’ve made this several times for the family. Thank you! I am so glad to know that. Thank you.